This is kinda-sorta embarrassing for me to admit, but the death of actor Christopher Jones at age 72 last Friday slipped right under my radar. Maybe it was because his passing was overshadowed by the weekend deaths of Maximilian Schell and Philip Seymour Hoffman. Or maybe his demise simply didn't get much publicity because, unfortunately, it had been a long time since many people gave much thought to what Jones did while he was alive. For the benefit of those who tuned in late: Jones was one of several broodingly handsome hunks who were hyped as likely heirs to the late James Dean during the two decades or so following that legendary screen icon's death at age 24 in a 1955 auto crash. After attracting attention in The Legend of Jesse James, a 1965-66 TV Western, the Tennessee-born Jones graduated to motion pictures with starring roles in Chubasco (1967), opposite Susan Strasberg (to whom he was married briefly); Three in the Attic (1968), a wink-wink, nudge-nudge comedy in which he played a faithless stud who's captured and, ahem, erotically exploited by three vengeful lovers; and The Looking Glass War (1969), a John le Carre-inspired spy thriller best remembered (by those who remember it at all) as an early showcase for supporting player Anthony Hopkins. 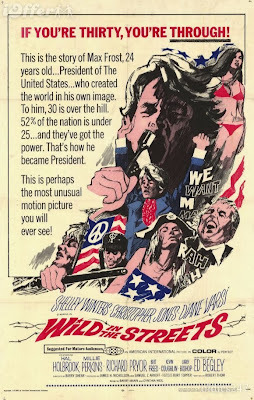 Three in the Attic was a minor box-office hit -- successful enough for its distributor, American International Pictures, to follow up with the totally unrelated Up in the Cellar (1970) -- but none of these films generated nearly as much critical and audience interest as Wild in the Streets, the 1968 cult-fave political satire in which Jones quite impressively played Max Frost, a megalomaniacal rock star who contrives to become President of the United States -- and then ships everyone over 30 into reeducation camps. The frankly absurd but arrestingly outlandish dramedy has always had a special place in my heart -- it was the first movie I ever reviewed for a professional publication, while I was still in high school -- but it's also fondly remembered by many other folks my age and younger, primary for Jones' moody-menacing lead performance, an early appearance by Richard Pryor in a supporting role, and a soundtrack that includes the defiant youth-rebellion anthem "Shape of Things to Come" (which, believe it or not, was co-opted for use in a Target TV commercial a few years ago). After the surprise success of Wild in the Streets, Jones started to be taken seriously as, if not the Second Coming of James Dean, an actor of considerable promise. So seriously, in fact, that no less an auteur than David Lean cast him as a shell-shocked British solider who has a tempestuous affair with the neglected young wife (Sarah Miles) of a middle-aged Irish schoolmaster (Robert Mitchum) in the epic 1970 romantic drama Ryan's Daughter. Unfortunately, the movie was trashed by critics -- even though, as I recall, it was much better than its reputation indicated -- and ignored by audiences. Lean didn't get another movie off the ground (A Passage to India) for 14 years. As for Jones, whose performance was not viewed as one of the film's saving graces -- well, depending on which story you want to believe, he was traumatized by the violent 1969 death of actress Sharon Tate (with whom he had an affair), or he realized he really hated acting, or he couldn't get arrested after Ryan's Daughter, or all of the above. In any event, he walked away from show business, and retreated into obscurity. Quentin Tarantino tried to lure him of retirement with the role of Zed in Pulp Fiction, but Jones passed on the offer. He resurfaced briefly in 1996, when he played a minor role in the little-seen Mad Dog Time. But that, as they say, was that. Because sometimes the magic happens, and sometimes it doesn't. Sometimes you aim to be -- or other people groom you to be -- the next James Dean. And sometimes, when you pass away, even people who half-remember your best work will instinctively think: "Wow. I thought he died years ago." Such is life. Although, I suppose I should use as an object lesson on what NOT to do in an acting career. I remember Christopher Jones very well. I was his friend for many years. We had some wild times hitting the Hollywood Bars when his gal friend, Carrie, came home from work. I managed the building he lived in. It's all in my book THE GOSSIP COLUMNIST. I tried to get him work with American International Pictures. They wanted to see him, but he didn't want to see them. Tarantino spent a night in a restaurant trying to get him to be in one of his movies. Chris turned him down and that ended his relationship with another woman he lived with.